A chic, functional spin on a classic design, Gaiam’s Top Loading Yoga Mat Bags are roomy enough for your yoga, Pilates or fitness mat. This 100% cotton mat bag also sports a zippered front pocket to hold essentials to tote back and forth from class or the studio. Machine wash and dry flat. 24″L x 6″ diameter. Gaiam was created as a lifestyle company with the vision that, given a choice, people would choose a lifestyle that is healthy and life enhancing, for themselves, their families and the Earth. The Gaiam lifestyle is a vote for individual health as well as the future sustainability of the Earth’s resources. Gaiam strives to provide customers with alternatives to traditional products by offering natural, or healthy versions that compare with the style, quality and price of conventional products. Gaiam’s goal is to become the trusted source and unifying brand for Lifestyle of Health and Sustainability (LOHAS) participants. They understand that the opportunity to affect people’s lives with information and products is both a privilege and a responsibility. Gaiam believes in the concept of Conscious Commerce, the practice of making purchasing decisions based on personal values and beliefs. It takes into consideration all the aspects of our lives and the impact we have upon the planet. Research indicates this concept appeals to approximately 50 million people in the U.S. alone. Gaiam’s strategy in delivering the distinctive quality for which they are known is to partner with experts in health/wellness, eco-living and personal development to develop proprietary products that meet our customers’ needs with meaningful solutions. The name GAIAM is a fusion of the words Gaia (the name of Mother Earth from the Minoan civilization in ancient Crete), and I am reminds us that we are all interconnected with the Earth, the air and water, and very much a part of this living system that sustains us all. Able to withstand any workout environment as well as the daily commute to/from your practice. It is recommended that you store your mat rolled in bag while not in use to help extend the life of your mat. Quickly and easily store your mat by loosening top drawstring and sliding rolled mat into bag. Easily adjust the shoulder strap to your height and preferred carrying position. Tightly secure your mat inside the bag with a drawstring clasp. Secure your belongings during and to/from your practice in the zippered front pocket. 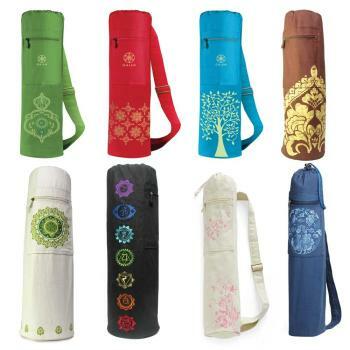 OM Yoga Mat Bags – Full Zipper Cargo Tote – with Shoulder Straps – 4 Pockets.